What happens if you have a hard disk which spins erratically, or the heads are making clicking noises, or maybe everything seems fine but the disk is just not recognized by the PC or any other tool? Since you don't have access to the disk to recover data you may conclude that it is due to the controller board failure or some mechanical or physical damage, and whatever you try to do to recover data is then driven simply by your intuition because you have no information about the status of a drive that is simply not recognized by your utilities. But help is at hand, because the PC-3000 UDMA is a unique data recovery tool that can communicate with the drive in such situations by using vendor specific commands to switch the drive into kernel mode - the one that is used by the manufacturer to provide read/write access to the firmware on the controller board and firmware modules, such as Microcode Overlays, HDD Configuration Tables, Defects Tables, SMART Attributes, Security Subsystem, Adaptives, etc., stored at the disk system area (maintenance track) at negative cylinders. When the drive is not recognized by the PC, it basically means that the HDD cannot boot up properly due to electrical failure, mechanical/physical damage or corruption of the firmware modules on the controller or the disk system area (maintenance track). By using PC-3000 UDMA you can diagnose the drive and determine exactly what is causing the failure. Furthermore, in our experience more than 50% of such failures (and for some particular HDD models over 90%) are due to firmware related problems that can be resolved using PC-3000. You can simply reload firmware modules onto the damaged drive or just use one of the PC-3000 built-in fixes available for the most common failures of the particular HDD model, such as Fujitsu MPG's firmware damage, Maxtor's G-List/P-List corruption (e.g. 'Maxtor N40P' and 'Maxtor Athena' family), Western Digital's S.M.A.R.T. counters overflow and others. The PC-3000 UDMA supports 2.5"/3.5" ATA/SATA Hard Disk Drives from the following manufacturers :- Maxtor/Quantum, Seagate, Western Digital, Fujitsu, IBM/Hitachi, Samsung, and Toshiba. For more information about the data recovery products visit www.deepspar.com or www.acelaboratory.com. Attention: Some companies in Asia, especially in China and Malaysia, e.g. www.ace-laboratory.com, sell fake PC-3000 PCI boards that are not functional! These boards are an obsolete version of the new product - PC-3000 UDMA. We receive lots of requests from unsatisfied users who bought fakes of our products and could not use them. Please contact one of the following companies to verify sales channels supplying original products. PC-3000 and Data Extractor are registered trademarks of ACE Laboratory, Russia. Copyright © 2003-2009 DeepSpar, ACE Data Recovery Engineering Inc. All rights reserved. 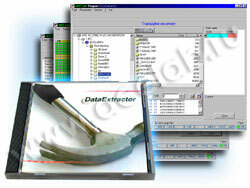 Member of The Ardenix Group, Data Recovery Ottawa.